New Year, New You? No matter how much you dislike going to the gym, it’s one of the most popular resolutions made every year! If you’re one of the few who kept up those fitness resolutions, I bow down in respect! My ‘Monday’ hasn’t quite arrived yet. Somehow, we make going to the gym harder than it sounds. There’s always going to be an excuse to ‘NOT’ work-out… plans with bae later? Catching up with the girls? Don’t let these excuses stop you from living a healthier life. You need to keep a just few things handy in that gym bag so that you can look fab before, during AND after your workout. If you were looking for some make-up and beauty products for the gym, your search ends here. Keep this checklist handy the next time you go shopping and we promise you’ll look stunning through and through! These are your ultimate must-have gym bag essentials, check ‘em out. This one was pretty simple right ladies? We don’t want to be smelling foul during those intense pumping sessions do we? The Nivea Body Deodorizer is a replacement for conventional deodorant formulas that tend to stain your clothes. When you’re in the gym, you want to avoid smelling of an overpowering scent. It’s a big no-no. 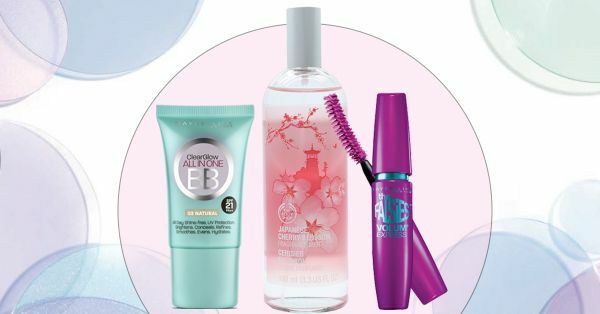 Opt for something light and easy like the Body Shop Cherry Blossom Mist. It’ll keep you smelling fresh and subtle all through the workout. A gentle deep cleanser is a must post your workout. It’ll ensure all the oil and sweat clogging up your pores will be cleansed thoroughly. Don’t skip this step especially if you have problematic skin. If you’re stepping out after the gym, follow this up with a gentle moisturiser or sunscreen. The Ultrasheer dry touch sunscreen has a broad spectrum SPF of 50+ to protect your skin from darkening and sun spots. It’s matte, oil-free and won’t leave a sheen on your face. If you’re stepping out even for 10 minutes in the sun, do not skip sunblock! If you don’t have the time to wash your face after a workout, don’t forget to use a wet wipe to refresh and hydrate you while you’re on the go. These are perfect for cleansing your face and body post workout if you don’t have time to shower. The Maybelline New York BB cream is perfect if you want to wear a ‘little’ bit of make-up to the gym! Not that we recommend it, but if you’re super self-conscious, stick to a BB cream. You don’t want to be wearing foundation to the gym. Keep in mind, this may start smearing off as you sweat! This is a great option if you have somewhere to be post that workout, it will enhance your skin’s natural glow while giving it light, undetectable coverage. If there’s one essential you’ll find in my gym bag, it’s a good mascara. Pick a waterproof mascara if your workouts are intense and make you sweat a lot. The Maybelline Falsies Mascara lengthens and volumises the lashes, and gives your eyes a fresh, more awake look. If you like dramatic eyes, this is your pick. This is the only make-up I personally wear to the gym. A lip balm with a slight tint will keep your lips hydrated and add a pop of colour to your face. Pick one that’s subtle and not too shiny. This collection has a great selection of shades and a handy throw in your gym bag kinda packaging! This is perfect for adding some colour to your pout post workout too! Post workout hair can be quite difficult to deal with especially if your choice of workout is more cardio based. Sweat and oil makes its way to your scalp leaving your hair greasy and not pretty! The BBLUNT Dry Shampoo is going to be essential on days when you don’t have the time for a hair wash. It will take away the oil and give your hair instant volume and leave it smelling fresh.